David Carr tests a little boy in China’s Fujian province where hearing impairment is rampant among the children. David Carr, BC-HIS, is president of the Hearing Healthcare Alliance of New York and CEO of McGuire’s Hearing Aid Service, a five-office operation in eastern Long Island and at Montefiore Medical Center in Bronx, NY. In November 2004, “a time in my life when I was looking to give something back,” he says, colleagues fromOmni Hearing Systems told him they were going to China to test deaf children and they were looking for volunteers to go back to China for follow-up care. Through Omni, Carr was introduced to Mary Willette, leader of CompassionNet, a non-profit, faith-based organization. Willette told Carr more about the deaf children in Fujian province in the People’s Republic of China. Their families abandoned them because they felt shamed by their children’s condition. Carr began assembling people and equipment for a humanitarian mission. 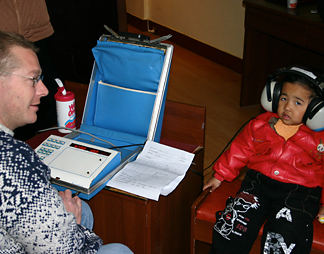 In 2005, with hearing aids donated by the Starkey Hearing Foundation and testing equipment and airfare provided by McGuire’s, Carr and his team, which included audiologists, hearing instrument specialists, and a pediatric ENT physician from Montefiore Hospital, made the 24-hour trip to Fuzhou, the capital city of Fujian province, and then a 7-hour minibus ride into the mountains to treat nearly 300 hearing-impaired children, ranging in age from 18 months to 16 years. The group visited orphanages and schools for the disabled in four villages, fitting about 150 children with hearing aids on the 10-day trip. Carr estimates that about 10% of children in the region are profoundly deaf. He attributes the high incidence to gentamicin, an antibiotic commonly prescribed there to combat fever, but one that can cause neurologic damage to the inner ear. Communicating with the children required interpretation among three languages—English, Mandarin, and Chinese sign language. In each village, government officials and village elders watched the team closely. Living conditions for the children and the team were primitive, with no heat in near-freezing weather. Carr said they tested and treated patients wearing five layers of clothing. In one village, the team met Chen Nan, a profoundly deaf 13-year-old girl, who needed a cochlear implant. Once back in the United States, Carr began a fundraising effort to pay for the operation in China. He reports that Chen Nan is making progress with her speech and rehabilitation. “We were able to do so much with relatively little,” Carr says. Like so many others interviewed for this article, Carr’s humanitarian spirit is in evidence at home as well as halfway around the world. Last month, McGuire’s fitted more than 50 Long Island and Bronx residents with hearing aids donated by the Starkey Hearing Foundation.